The Pittsburgh Pirates Spring Training Headquarters in Bradenton, Florida is known as "Pirate City." And there's no better place to spend a sunny Florida day in February or March! Pirate City is a great place to watch baseball spring training, Florida style: That means outdoors in the late winter and early spring sunshine amid warming temperatures. The Pittsburgh Pirate practice sessions are free and open to the public at Pirate City. Pirate City is a unique place because of the proximity between the work-out fields and the fans. It’s also a place in which you can “feel” baseball history while you watch the beginnings of another new year of baseball. LECOM Park has benefited from numerous renovations since the turn of the century. The historic ballpark maintains the classic charm of a venue with more than nine decades of baseball history. The Spanish Mission-style façade visible from several blocks away is an iconic architectural feature recognized throughout professional baseball. The baseball facilities at LECOM Park include two full grass fields professionally maintained year-round. Four bullpen mounds, a standalone multi-tunnel batting cage structure, home and visiting locker rooms, and an umpires' changing area provides ample space for a wide array of baseball activities. Fixed seating can accommodate more than 7,500 fans. Standing room brings the park's capacity to 9,000 people. So, what are you waiting for. Plan your trip down to Bradenton Florida to visit some up close Spring Training Baseball and cheer on the Pittsburgh Pirates. While you are down, make sure to get in some beach time by visiting Anna Maria Island. Dans Florida Condos (www.dansfloridacondos.com) offers you 1br and 2br units, right across the street from the Gulf of Mexico. 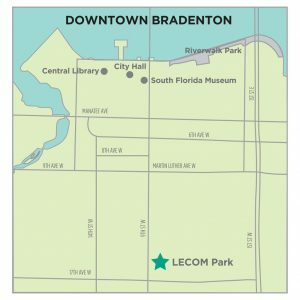 Only 20 minutes away from LECOM park, you can spend the half the day at the beach and half the day at the ballpark. What a great combo!